A classic 1950’s era Austin Healey motor vehicle that had stalled at the Fair Oaks rail crossing in Atherton was struck by a southbound Caltrain locomotive Saturday evening. The vehicle was dragged under the front of the locomotive for about a quarter of a mile until the train was able to stop just short of the Watkins Avenue rail crossing. The driver had left the car and was not harmed. Menlo Fire Captain Tim Bogner on Menlo Engine 3 arrived on scene at 8:17 pm and reported that there was a white convertible vehicle on fire that was pinned and entangled under the front grill of a locomotive. After extinguishing the vehicle fire, Menlo Park firefighters were able to free what was left of the classic car by about 10:30 pm using the jaws of life and other extrication equipment to free the twisted metal and debris from under the much larger locomotive. 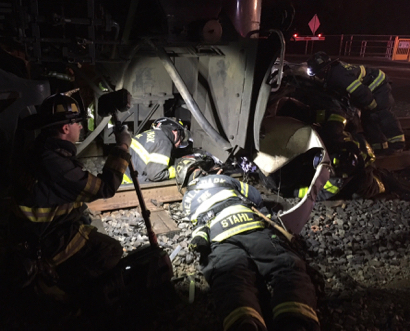 A total of over 300 passengers were safely transferred to another train while Menlo Park Firefighters disentangled the vehicle from the front of the locomotive. There were no injuries reported. “This is the second vehicle that has been struck at this intersection in the last four years and then caught fire,” said Fire Chief Harold Schapelhouman. “The last time this occurred in December of 2014, a driver following his navigation system on a dark and rainy night turned onto the tracks and the vehicle became stuck. Fortunately, in both of these cases, the drivers were able to escape from their vehicles before being struck by a train”. I showed this video to the Caltrain Board right after a young mother was killed in Menlo Park: https://youtu.be/cuO2Fu63d0o. The cost is approximately $2M/crossing, so the entire Peninsula could be protected for half the cost of a single grade separation project.